Since the update came out that added Cymbals, Snare Drum, and a Bass Drum I have updated 3MLE to add these instruments plus the Celesta and Recorder. The drums in-game only play 1 note sound, no matter which note you play. To try to mimic this function I have locked the drums in 3MLE to their corresponding notes in-game. Normally with drums you can have a little bit of variance in the sounds, or since this is digital use pitch bending to achieve the same function. When viewing the drum in the instrument list, it is also included in it's name what the notes need to be. These sounds are originally in the drum kit. I extracted them from the drumkit dls and spliced them manually back as individual instruments so they can be selected correctly in 3MLE. You can download the new version of 3MLE Maple Beats Edition on its usual download page here. A new feature has been added to the site allowing you to bookmark forum posts and submissions in the music databases. This will allow you to categorize and bookmark your favorite music on the site and keep it all in one handy place. You can set a bookmark as Private or Public, if the bookmark is public it will appear on your profile. Private bookmarks will not show up in your profile, or on the activity feed. You can "Sticky" a bookmark to the top of your list, and if it is public to the top of your profile. You can export your bookmarks to XML or HTML format for external sharing. 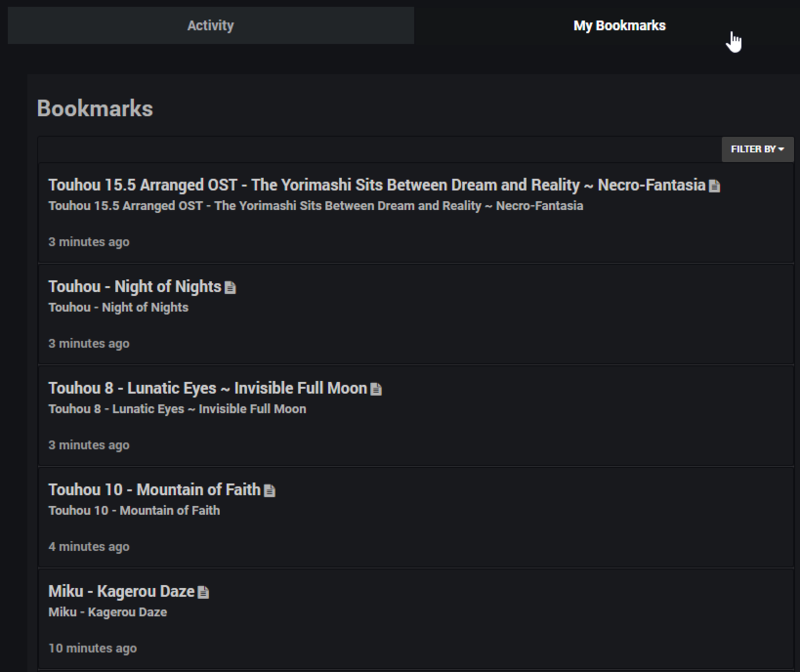 You can access Your Bookmarks anytime by clicking on your username in the top right, and then clicking on "My Bookmarks"
Once in that area, you will be able to see your bookmark categories and view them all at once or filtered by categories only. If a user has their bookmarks as public you will see a new tab on their profile simply named "My Bookmarks", you will be able to see a list of their bookmarks. When you are viewing a submission, the "Bookmark" button will now appear next to where the Report Submission button it at the bottom of the post. If you have any questions please feel free to respond to this announcement post, or ask in our Discord. Me and Couch are looking for some SSR's (Song Submission Review Team) to help us keep up with the approval queue. Now that full release for MapleStory 2 is coming we expect it to pick up even more. The queue is already usually at 60+ so if you are not able to give to much time to this role please do not apply at this time. There is not a "quota" but you should be able to spend a few hours a week total on helping us approve music submissions. The SSR role is split between Mabinogi Only, and MapleStory 2 only. This is all volunteer work obviously, but you will get a pretty color / rank in Discord and on the site. *Note: The applications are private, only me and couch will be able to see your application submission. We have done some website updates over yesterday and I just wanted to touch on them here. These are mainly back end, and underlying software updates so if this kind of talk makes your eyes glaze over I will understand if you skip the announcement. ? As the expression is told, lets go ahead and get the elephant in the room out of the way. Yes, we have enabled ads however we have tried to make sure that they are non-intrusive. No pop up, or pop under ads will happen, and we tried to make sure all of the ad placement was in a way to prevent accidental clicking and also not ruin the flow of content. The ads help us do things like: Renew our licensing for the website software, pay our server and bandwidth bills (Our bandwidth increased by 300% during the MapleStory 2 closed beta test), as well as work with developers for custom additions to the site or to buy existing add-ons. We may consider an optional donation option for those of you would rather donate than see ads. We know a lot of people use an ad blocker of some kind. But if you are feeling nice every once in a while and want to turn off your ad blocker for a few page visits we would really appreciate it. Improved caching on the site has been enabled with a Redis server. Before we were not actually using any server-side caching and instead relying on Cloudflare to do as much heavy lifting as possible and it definitely did a lot of heavy lifting for us. It served over 2.5 million requests from its edge servers, and saved us about 100 GB of bandwidth on 1 TB of bandwidth spent which is good considering a chunk of our bandwidth is actually .mp3 previews with Cloudflare does not cache natively. The Redis cache engine will help take some of the load off of the MySQL database and the over-all web server by caching page output, searches and tags for guest users. Some of you might have noticed while using the site yesterday that for a brief period of time search didn't work, and all of the activity feed disappeared. This was me fumbling through an Elastic Search server set-up and then re-indexing all of the content to the new Elastic Search cluster and shards. Before, search was using the MySQL database directly this can put a huge strain on the database as it is having to support normal website use plus searching through thousands of rows of data for multiple users. By offloading the search system to the Elastic Search cluster it will speed up performance in general for searching but also provide better search results. It will now weight search results based on keywords and other factors. You should see improved search results going forward, and they should improve over time as well. It will search the entire index based on your keywords and then pull out 10,000 rows of data and compare them to your keywords and other factors to try to provide better results. It does all of this within a second or so basically. Search has been made more clear in general as well, before it was kind of a "Am I searching the entire website? Just this submission? Just this category?" Now when you begin a search a pop up window specifically says if you are searching every where, or just in a specific section. We have added language packs back to the site! You can find the drop down selector on the left hand side of where the menu is at the top, Or at the very bottom. We already have 10 languages supported, with Chinese (Traditional and Simplified) on the way. In the future we hope to support Korean and Japanese as well since we get a decent amount of traffic from those countries already. Please note, this only translates system text, if the post is written in English that will still be in English. When clicking on the emote button in the editor now, it will have options to choose a skin tone, search and look through categories just like on a phone or tablet. We have the following releases / changes coming up which will be available in a separate news post as this one is already very long. A "Light" version of our theme for users who do not like the constant dark mode. News on how we are currently using the source from Mabilcco to modify it to support code editing, 10 tracks per part, and more. Unfortunately we did not finish the 3MLE package in time while the first closed beta test was still running for MapleStory 2 but at least it will now be available going forward. The 3MLE Download page has been updated to include a link for the MabiBeats version, and the MapleBeats Version. All of the instruments that show up on the in-game composer have been added to the instrument drop down list. In the coming weeks we will add the rest of the ensemble halls to MapleBeats (You can have up to 8 people in an Ensemble for MS2). Going forward, all previews generated in the MapleBeats section will now sound how it would sound in the game. We will not be retro-updating the previous previews to match. On another note, Welcome and Thank you to all of the new members who have joined us from the Maple Story 2 side. Our spike in traffic has been tremendous taking us from 900K hits a month to already 2.1 Million hits and this was just during the one week beta. We are looking forward to release and serving the needs of the global MS2 community when the time comes. We hope that 3MLE MapleBeats Edition will be useful to the music community, and we look forward to everyone's contributions to the Music Halls!